ATHENS - Greek Prime Minister Alexis Tsipras formally tendered his government's resignation to the President of the Republic Prokopis Pavlopoulos on Thursday evening, requesting the conduction of snap general elections. The Leftist leader visited the head of state shortly after announcing his decision to step down in a televised address to the Greek people. "The popular mandate I received on January 25th has run its course. 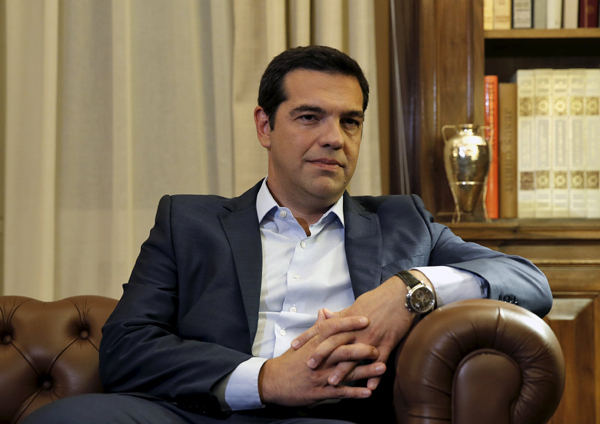 Now the sovereign people of Greece must weigh in," the Leftist leader said in his address. He explained that he decided to resign to allow citizens to give their verdict again on the third bailout his government reached with international creditors to keep Greece afloat and in the euro zone. The Greek leader acknowledged that his government did not achieve the deal it wanted when it took power, and made concessions after meeting resistance by lenders, but defended the new program as the best possible opportunity to move forward. No preferred date for the conduction of the early elections was mentioned during the address or the dialogue with the President in front of cameras. Greek Prime Minister Alexis Tsipras (L) leaves the presidential palace after meeting President Prokopis Pavlopoulos in Athens, Greece, August 20, 2015. According to government sources Tsipras will suggest September 20. However, in a first reaction to the developments the leader of the main opposition conservative New Democracy party Vangelis Meimarakis said during an emergency press briefing that his party will make the utmost effort to avoid the polls for the benefit of Greek people. Meimarakis accused Tsipras of seeking elections to tackle the rebellion to the bailout within his Radical Left SYRIZA party. In the vote in parliament last Friday to ratify the deal more than 40 SYRIZA MPs in the 149-member strong parliamentary party group voted against party line. 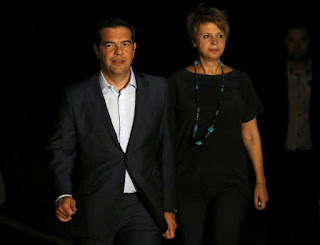 As dissenters have announced their intention to form a new anti-bailout political movement soon, according to political analysts in Athens, Tsipras opted for the snap polls in a bid to clear the picture and strengthen his hold on power in order to implement the bailout. Under the Greek Constitution should a government resign, the President should hand an exploratory mandate to each of the leaders of the three largest parties represented in parliament to try to form a government from the current parliament. Tsipras stated during his meeting with Pavlopoulos that he will not use the mandate and asked instead the President to initiate procedures for the immediate formation of a caretaker government led by the head of the Supreme Court to take the country to elections. Under the Constitution each mandate lasts three days. Meimarakis said on Thursday evening that he intends to make full use of his mandate and try to form a unity government. If he fails to do so within three days, under the Constitution the mandate passes over to the third largest party elected in parliament which today is the far- Right Golden Dawn. If all efforts end fruitless, the President calls early elections which must be conducted within a month. The process of the exploratory mandates could be avoided with the agreement of political leaders and a caretaker government be appointed within hours. Pavlopoulos reassured Tsipras that he will exercise his duties according to the Constitution to ensure that the country will meet its commitments under the recent deal and there will be no risk for its course in the European Union.